With spring about to arrive in just five short days, you are likely getting pretty excited about the return of warm weather. It is probably that you, like our team at A&C, are also looking forward to your lawn not being covered in snow and ice anymore. Just the idea of what is to come in the months ahead is enough to make us giddy here at A&C Sprinklers. We love the idea of spending hours a day soaking up the sun and enjoying the many activities that come with spring and summer. While it would be nice if no preparation was needed at all where your lawn is concerned, this is unfortunately the case. This is especially true when you are considering your sprinkler system. It’s officially time to give your irrigation system some love and attention. It is probable that before winter arrived last year, you used our sprinkler experts to complete a blowout on your sprinkler system, which was a great move. Now that March is here, and spring is just around the corner, it’s time to get that sprinkler system back in working order. 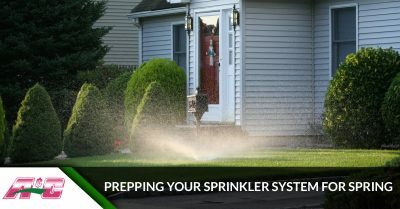 Due to the nature of weather in New Jersey, it would not be uncommon if you find that your sprinkler system is not in working order when you attempt to turn your system on. Since we do experience freezing temperatures in Toms River, you may have broken pipes, malfunctioning valves or a busted sprinkler head. None of which you will know about until you turn your sprinklers back on. Checking to see what condition your sprinkler system is in before ever beginning any other yard work is the best plan of action. If you choose to plant things in your yard or even landscape before you have made sure your sprinklers are working, you may find that you have to undo all of your hard work to reach the parts of the system that require maintenance. The best way to complete a thorough sprinkler check is to turn on a single station at a time. If you have a test function on your controller model, use that to ensure that everything is in working order. This will make it easier as these systems will normally have each station run for about two minutes so that you can access whether they are working properly or not. If you notice that one of your stations has very low pressure and that the spray heads are not popping up the way they should be, this means that you likely have a leak. If this happens, don’t be alarmed! With literally hundreds of connections in your lawn’s sprinkler system, there is bound to be a leak from time to time. If you happen to find that your sprinkler system isn’t working the way you need it to upon inspection, there is no need to fret. Just as we helped you to blow out your sprinkler in the fall, the talented team at A&C Sprinklers can help you with a measly little leak. When you call our sprinkler company, we will not only get to your residence or business as soon as we can, but we will also help you to make a plan of action regarding how to get the most out of your lawn once your repair is complete. Contact us at A&C Sprinkler today and we will help you to get your Toms River yard ready for spring and summer quickly and for the best price possible. Find Out How A&C Sprinkler Can Help You!